If you are searching for a brand new water heater to buy, Rheem is one of the most popular brands to consider. When you have it installed at home, there is less to worry about your comfort. With hot water available on demand, you will never be bothered by the cold. To fully maximize its benefits, however, be sure to pick the right product. Having a hard time deciding which product can provide excellent value for money? To help you out, read this Rheem water heater review. We will briefly tackle some of the most notable features you can find in this brand and we will also quickly review one of its most popular models. This will make you understand why many people love Rheem. Like other brands, Rheem has a wide selection of models under its portfolio. In this section, we will not go through each of the models, but we will briefly tackle some of the common features that they share. These have been developed by Rheem to give their water heaters an edge over their competitors. High-Quality Construction; From the Prestige to the Marathon series, among others, the products from Rheem are known for being exceptional in terms of quality. One of the reasons why they are expensive is because they are made of the best materials that are available. For the tank water heaters, for instance, they have polyurethane or polybutene insulation. The latter will be able to resist wear and tear while also being exceptional in the prevention of heat loss. When you purchase a water heater from the company, you can expect that it is going to withstand the test of time. More than being durable, their water heaters are also lightweight, especially the Marathon series. This means that moving it around will be easy. The installation is also going to be effortless. Despite being lightweight, the materials can resist corrosion. They are also impervious to rust. The durability, however, will depend on the specific model you will pick. Multiple Power Sources: With Rheem, versatility is another thing that you can enjoy. Regardless of the source of power that you prefer, there is a model that can prove to be a suitable choice. On the top of the list would be the gas and electric models. As an alternative, you can also opt for those that are solar-powered, which is a great way to save energy in the long run. Aside from the source of power, they are also categorized on the basis of their type – either tank or tankless. Plus, there are choices for residential, commercial, and industrial applications. An Abundance of Safety Features: From the cheapest to the most expensive models of water heaters from Rheem, you can expect that they have the best safety features that are available, providing you with the assurance that they won’t be a risk in the household. Many of their products are categorized as FVIR or Flammable Vapor Ignition Resistant. This prevents the ignition of flammable vapors outside the combustion chamber. There are also models that are equipped with a thermal fused upper element, which will be great in terms of the prevention of dry firing. The quality of the materials used is also exceptional, making their water heaters safe in different environment conditions. High-Altitude Options: If you live in a place that has a high altitude, some water heaters may not perform as expected. Their heating capability can be compromised. The amount of oxygen is decreased in a higher altitude. With this, especially for gas heaters, they won’t be as efficient. The good thing is that Rheem has water heaters that are designed specifically for high altitudes. For the tankless heaters, there is a model that is suitable for an elevation of up to 9,840 feet. For the tank water heater, on the other hand, they have a model for an altitude of up to 10,000 feet. Eco-Net: If you have always dreamed of having a connected home, Rheem has got you covered. In a nutshell, Eco-Net is an integrated system that delivers comfort, convenience, and efficiency. There are some models from Rheem that are capable of this feature. The water heaters can be connected to a control center or a compatible mobile application. The latter means that you will be able to control the different functions of the heater even at a distance. This also means that hot water will be instantly ready when it is needed since you can activate the unit even before you arrive at home. Low Operating Costs: A lot of people are concerned about the cost of using a water heater. This can be a significant addition to your monthly bills, especially when you choose a product that is power-hungry. In the case of the models from Rheem, it is a good thing that their water heaters are energy-efficient. You do not have to worry about electricity or gas consumption. Especially in the case of the tank water heaters, they have high-quality insulation that maintains the temperature of the water. The wall is thick enough so that the heat will be maintained. Within a span of 24 hours, heat loss is way lower compared to what you can experience in the other brands of water heaters. Extensive Warranty Coverage: Do you want to have peace of mind? You will have it if you choose Rheem water heaters because of the exceptional warranty offered by the manufacturer. You can be confident that they will stand by the quality of their product, even after years of use. The warranty described in the next paragraph applies to those that are part of the Marathon Series. In the case of tanks that are used for residential applications, the tank is covered by a limited lifetime warranty while the parts are covered for six years. On the other hand, in the case of water heaters for commercial applications, the tank is covered for five years and the parts are covered for one year. For most people, the steep price of this water heater is one thing that can withhold from having it purchased. Yes, it is expensive, but this does not mean that you should stay away from it. After all, looking at its features and benefits, you will realize that the price is worth it. This water heater has a capacity of 50 gallons. Despite the generous capacity, it is lightweight and has a sleek profile, which makes it space-efficient. It is mainly made of plastic material, which is why it is lighter compared to most of the competing models that you can find on the market. It might be lightweight, but the durability is not compromised, providing you with the guarantee that it is going to withstand many years of use. There are multiple layers of filament that cover the fiberglass to provide it with a strength that is hard to rival. Meanwhile, the outer shell is made of molded polyethylene, which provides the protection against scratches and dents. The manufacturer is confident that their heater will last for a long time, a proof of which is the warranty coverage that they are offering. This is a residential heater and the tank is covered by a limited lifetime warranty, which is one of the best things about this product. As long as you own the home where it is installed, it is eligible for the warranty. In terms of energy efficiency, this is also an exceptional product. One reason for this is the polyurethane insulation, which allows the water to stay hot for a longer period of time, minimizing the amount of energy that is necessary. It also has an energy factor of .90 to .94. With an innovative foam that traps heat in the tank, there is a lower likelihood that it will suffer from loss of heat. In the case of standard models, the temperature of the water can drop as much as 30% in a span of 24 hours. With this model, on the other hand, on average, water temperature will only drop about 5% within 24 hours. Now that you are done reading this Rheem water heater review, it should be clear by now why this is one of the top brands on the market. As also reviewed, the Rheem MR50245 Marathon can indeed be a great choice, given its heating efficiency and durability. Even with its high price, this can provide excellent value for the money! Thanks for mentioning that different types of Rheem water heaters can use different sources of power, including solar-powered or electric. 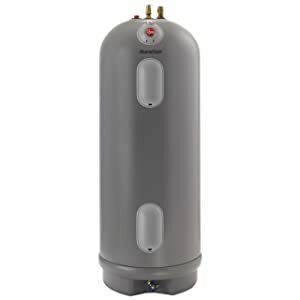 My husband and I need to install a new water heater in our house, so we are wondering what type we should use. Since our house runs mostly on solar power, we’ll have to go with a Rheem model.